As a new player I find myself struggling to design assembly lines for some later-game products because it involves so many levels of things to build and I can't hold it all in my head at once. I believe having quick access to a UI like mocked-up above would help immensely. Pressing a key, say, F1, while holding or hovering over an item would open its recipe tree. Clicking on an item above/below the current item would show the tree for that item, allowing players to quickly navigate up and down the whole recipe tree. This is very similar to the research tree. Unlike the research tree I've aligned items horizontally depending on how many steps away they are from the item we want to make. I think it is important in this case since products have to be physically moved from one assembing machine (chemical plant, etc) to the next, it's not just a matter of unlocking everything that's above what we want. I've also limited to 3 levels of parent components and scaled them down as they go to prevent the tree from getting too wide to see all of it on one screen. In my use case I don't care much about the products so I'm not sure how many levels of products would be useful, I'd be happy with shopping at five or six stores just one. A similar mod is What is it really used for? which essentially does this but without the tree-like UI, and only showing the immediate components and products of an item. Does this make sense? What do y'all think? 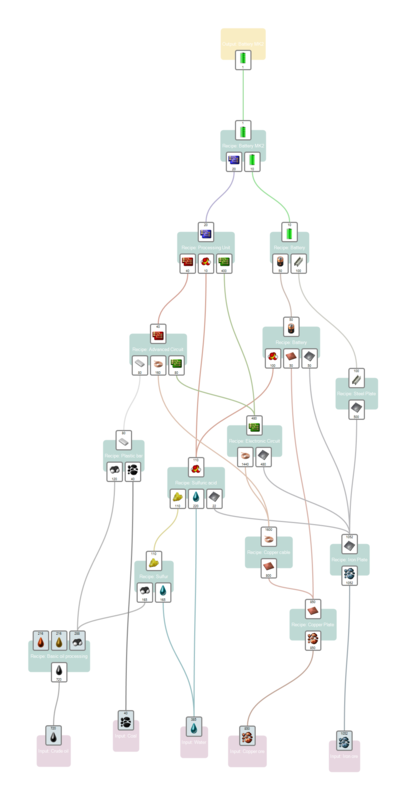 Recipe tree GUI. This should be the foundation of some kind of ingame factoriopedia. It should provide the player fast ways to get the answer to questions like: "what is this item used to?" and "What is the graph of recipe dependencies for this". Basically this, but written as part of the roadmap. some people who can't use FNEI to play AngelBobSpaceX mod even if their lives depended on it -> unsupported and unable to turn a 200+ hours game addiction into a 2000+ hours modded game religion blocked by ONLY this issue. Recipe tree GUI improvements (originally assigned to Onyx in older roadmap drafts, but no longer non-vaguely committed to). It will be SO USEFUL and SO NATURAL that even the FNEI-capable players will use it. What you propose (viewtopic.php?t=59313) is going to be problematic to implement in a way that works well for Bob's + Angel's. There are simply too many alternate recipes for too many ingredients. And too many loops where an ingredient in one of the steps is an output from a later step. That means before you can generate the tree, the player will need to make intelligent choices about which recipes to use, and somehow communicate that to the GUI. (Probably the easiest way to do that would resemble something like Helmod. Indeed if anyone wants to have a crack at doing this in Lua, at least as a proof of concept, then adding that chart to Helmod is probably a decent place to start. See https://mods.factorio.com/mods/Helfima/helmod or the image at https://www.reddit.com/r/factorio/comme ... _multiple/ or the video tutorial at https://www.youtube.com/watch?v=-9aADLch6r0, ). If your brain crashes under the load, well I understand. Bob's + Angel's (plus the rest of the stuff that is Seablock) makes my head hurt as well. To the point that I need to write things down or manually draw the sort of chart you linked to (or use Helmod to help keep track. For browsing the recipe choices and planning research, I still prefer FNEI). But none of this is a problem that exists in vanilla, so it isn't a problem the devs need to solve for vanilla. (Even if they did implement what you suggest for vanilla, a naive implementation that works with the set of vanilla recipes is likely to still have lots of problems with Angel's + Bob's). So this is the sort of thing that is probably best done as a mod. (Although if the devs want to work on it, then go ahead). I don't know, what FNEI means, but the linked ingredient tree is nice to have. So would like to see it as a low priority roadmap item for 0.18 if they got time to burn and insist on not implementing the spidertron (but would still prefer the spidertron over this). It would be neat, sure, but I like spreadsheets and no one can take that away from me! I concur, amongst all alternatives to this kind of tools, Foreman is my favourite by far. However, Formean - as all the other tools I know of - has one flaw : alternative recipe paths or recursive paths are not handled properly - even with only two recipes in vanilla (advanced oil, and coal liquefaction). With Bob's+Angels (which I've never tested, being a vanilla guy, n but that have been said to be extremely complex with many crafting trees possible for a single output), I think Foreman would not work either. @OP : If you have the same problem in vanilla - which I'm sure you and you brothers don't, then your request makes sense (I'd also love to see it in vanilla as a QoL improvement). But it's clearly not mandatory to play the game, and the fact that when you choose to mod your game, you can't play it anymore is not a valid reason to demand for this feature to be added. But I'm hopeful someone recodes it in a way I can use it at all --- or improve it! I totally wished it was a mod, but I'll live with some sort of website or local html5/webGL utility. There is also https://kirkmcdonald.github.io/calc.html (click the visualise tab). But that doesn't support Bob's + Angel's either. (Note sure whether it just needs the recipes added, or whether it will also need code changes. It does support Bob's however, and you can see how complex the graph gets with just Bob's for an advanced circuit. Source code is on github so it might be possible to adapt it to work with Angel's + Bob's). There are quite a number of tools that do more or less what Foreman does. If you spend a little time in here : viewforum.php?f=134, you'll find quite a number of such production tree calculators. Most if not all tools will fail when the crafting tree becomes a crafting graph (which I believe bobs+angel's add a significative amount). 1- If it's meant to calculate what ratio is best between input and immediate output for various situations such as modules and beacons --- I can do that without effort and call these "calculators". Calculators are legion and if they didn't exist, I can do these calculations fast on paper when tired and in my head when not tired. I SEE CALCULATORS AS AN ESSENTIALLY COVERED PROBLEM, EVEN IF NONE OF THEM IS PERFECT. 2- If it's about discovering what you need to make a X when you don't have shadow of a clue, even if it's only finding the first recipe in a set of 10 possible and ends up generally pointing out the very worse one --- it's a "Recipe tree maker" and I need one. I still can't play AngelBobSpaceX without one. if it supported AngelBobSpaceX or whatever combo I am playing, just by being part of the game or being able to read into mod files for recipes so it's not out of date quickly, it would be tremendously useful and required for some people to play AngelBobSpaceX to the end. https://factorio.com/blog/post/fff-277 relates to all GUI improvement efforts --- "Recipe explorer" is the entry that may or may not be what I need. 4- or a true recipe tree as in 3, but generated from mod data with adjustment for super frequent input to many intermediates being cluttery (AngelBobSpaceX), loops (AngelBobSpaceX's wood to saplings to wood), finding the proper furnaces that can do something then sorting by efficiency and already-reached tech (AngelBobSpaceX), or the whole thing being very large(AngelBobSpaceX). The whole thing brings a 200+ hours game into a 2000+ modded game. Without it, it's similar to playing vanilla without blueprints. P.S. : there is also that mod that puts a green/yellow/red dot depending on whether machines receive ideal or near-ideal input. That would be nice to be in vanilla. The concept is so NECESSARY that even other factory type games --- including SMALL FOLLOWING ones, get a mod like this pretty early. Bottleneck is definitely not needed if not going for perfect ratios. It is only nice to have. I use it when tweaking blueprints in creative mode. Recipe Explorer, is this a new feature or a name for the little window that tells you the recipe for an item? It is a new feature that will have some of the functionality of the mod (https://mods.factorio.com/mod/RecExplo). What is this item used for. Get me info about the ingredients. It could be quite a simple and small window, but could help with these problems, mainly for new players and modded games. Bottleneck is useful when messing around with multiple unfamiliar machines with complicated requirements, multiple paths to multiple input types, multiple side effect of producing certain ores a certain way, and options and modules, before having a sense of what you'll use in your optimal assembly line calculations --- the math goes AFTER you know really what produces what without costing too much. AKA "Bottleneck is good for AngelBobSpaceX". I agree it's more of a "nice to have" than a "must have" but it is a VERY nice to have in that mod combo! It seems that it has been removed from the list. Was that done in silence or is there a justification written somewhere as to why? [Koub] Merged into older topic with the same suggestion/request.